The SICK truth behind decades of failure to require permanent I.D. on dogs tested for any health certification is the worst genetic fraud affecting dogs today! The importance of screenings for health defects is as compelling as is the demand for positive identification of the dog being tested. Still, we all know breeders who proudly proclaim a pile of health certifications but who consistently produce health-impaired, dysfunctional, or extremely atypical dogs. How can that happen? The most obvious answer is the ongoing problem of positive identification such as tattoo or microchip every time, for every clearance. Since this site has relentlessly lobbied for positive I.D. since 2001, the veterinary testing organizations have moved towards better identification. However they still do NOT require tattoo or microchip on the dog and must rely on the testing veterinarian's certification that the dog actually has the microchip or tattoo. The other problem is the inherent anomalies (pun intended) in genetic studies. The best breeders focus on the total dog; temperament, health, and type - in exactly that order. Owners can live with and love an unhealthy or ugly dog but one with defective temperament is a joy to no one. I've said that in magazine columns for many years that it has become a popular quote. The best breeders adhere to the breed standard and they do health checks but they don’t breed paper! A champion title on a nutcase, a hip clearance on a dog with disk disease, or CERF certification on a dog that hides from things only it can see is crime against the canine. Dedicated breeders use health certifications as an important tool, not as a sales gimmick. Ironically, these are the people who, because of their dedication to canine health, are most easily fooled by a system that grew in up in the unstructured 60s when the Orthopedic Foundation for Animals was launched. One of the original OFA board members was Dr. Gerry Schnelle, who in 1937 published the first paper on what we now call canine hip dysplasia. A pioneer in the field, his Bilateral Congenital Subluxation of the Coxofemoral Joints of a Dog was the first definitive study of CHD. 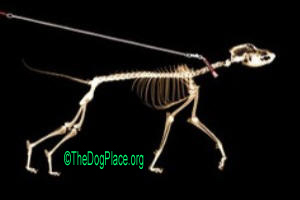 Dr. Schnelle publically resigned from the board of OFA due to unresolved ethical concerns, stating he could not certify an x-ray on a dog whose muscular condition, overall health, and other factors could not be evaluated. Identity fraud was at that time, not an issue. By the 1980s, health certification had become a breeding prerequisite fueled by good marketing and breeders eager to avoid an expanding list of identified canine health problems. Fraud was common because the veterinarians and the newly emerging certification organization did not want to rock the the boat. Over the next decade, fraud and diagnostic mistakes were hidden behind a smoke screen of genetic pollution spread by demand for offspring from a “healthy” dog. Who would admit that thier OFA certified dog became crippled or the CERF certified dog went blind? Not the vets, not the breeders, and least of all, the burgeoning health registries that were raking in $millions. OFA doesn’t care that less than 5% of owners ever re-certify a dog's hips or elbows due to expense, radiation exposure, or anesthesia risk. That alone makes a mockery of hip certification. But it gets worse. The priceless clear-hips certificate may not belong to that dog. Substitution has become so common that breeders joke about dogs that "glow in the dark." Requiring permanent, positive identification for certification is fundamental to meaningful results. How could this be ignored? The answers are disturbing but first, a little history. In my Dog World columns of the early 70's, I repeatedly demanded tattoo prior to testing and continued to lobby for permanent I.D long after microchips were invented. Why has veterinary mega-business rejected such an obvious solution? #1 - The Veterinary associations and universities have no stake in requiring permanent I.D. because no veterinary license is required for tattoo, microchip, or collection of a DNA sample. Owners collect DNA swabs, inject microchips, and tattoo their own dogs. No profit, no motivation. It's just the way things are today. #2 - If verifiable I.D. were required for health certification it would dramatically reduce income for the health registries and the veterinarians who perform the tests. The percentage of “ringers” is unknown but is believed to be astoundingly high in certain breeds. If positive I.D. were required, well, substitute dogs couldn’t be used. It would no longer be easy for unscrupulous breeders to collect certifications; therefore testing income would be proportionately reduced. Simple finance. If anyone still believes not-for-profit organizations can't be financial goldmines, they are too naive to gain anything from this article. This was written April 2011 and while there have been exciting advances in canine health and the plethora of new "certifications" in 2015 do require permanent identification for dogs to be tested, there are other serious flaws in our canine health certification system. If you believe there is hope for constructive change, learn more in the related displays below, especially "Health Certification" part 2. Getting a CT or MRI? 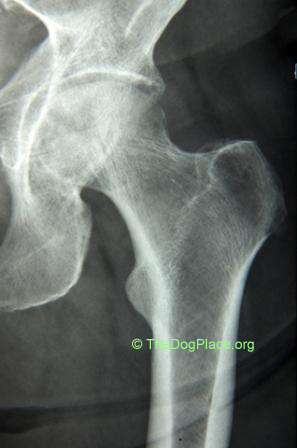 Doing hip x-rays on your dog? Know the risks. A wonderful tool as long as we know factor in inherently fatal flaws.